Economic evidence shows that, in addition to boosting economic growth, immigration leads to a positive impact on wages of native-born workers. “Boosting economic growth” is a bipartisan goal. In fact, both the 2016 presidential candidates mentioned some version of it on their campaign websites. One way to boost economic growth is to increase the number of people working, and one way to get more people working is to increase immigration. Economic evidence shows that, in addition to boosting economic growth, immigration leads to a positive impact on wages of native-born workers. Evidence also suggests that immigration boosts innovation. A recent study by one of us looks at the effect of Jewish émigrés from Germany during World War II on American innovators and innovation. The study finds a significant increase in innovation—in fields entered by immigrants, there is a 30% increase in patents by domestic inventors. These benefits are driven at least in part by contacts between immigrants and native inventors. One of the mechanisms at play is that American inventors come into contact with new sets of ideas and methods that they then use for their own work. Immigration has been in the news multiple times this year. President Trump has issued two Executive Orders on immigration (which have been opposed by many companies), and on April 18, he ordered agencies to review existing immigration policy, including H-1B programs, as part of the “Buy American and Hire American” Executive Order. The H-1B visa program grants temporary visas to 65,000 immigrant workers a year. The program is greatly oversubscribed—the program received 199,000 applications in the first five days of the enrollment period, before it stopped accepting applications—and this has led the government to use a lottery system to award visas. 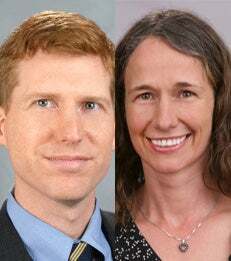 Robert Seamans is an Associate Professor of Management and Organizations and Petra Moser is an Associate Professor of Economics.